The latest Reuters poll is showing 24 out of 43 economists projecting the first rate hike in the US by June of next year. The futures market is pricing liftoff by September. Citi's latest analysis puts it in December. 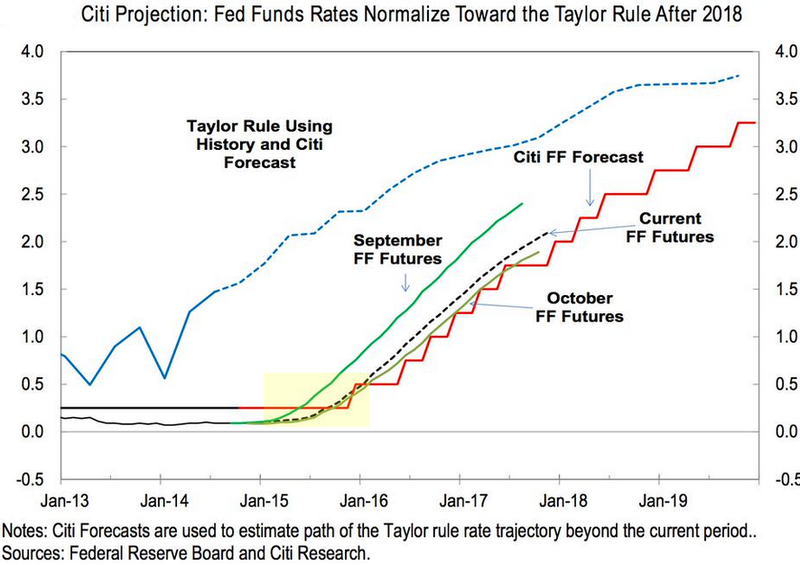 And all of these forecasts are running way behind the so-called Taylor Rule, which is suggests that the Fed Funds rate should already be at 1.5%. In fact the US economy can easily handle non-zero short-term rates at this point. The banking system is quite healthy and can easily manage funding costs of 1.5%. Corporate borrowers can deal with slightly higher rates as well. And as far as mortgages are concerned (to the extend higher short-term rates extend to longer maturities), borrowers for whom payments become prohibitive at 5% vs. 4% should not be taking out a mortgage to begin with. Furthermore the issue with the housing market these days has more to do with tighter mortgage credit rather than rates. But it's no longer as much about the US economy as it is about external factors. The international situation has made the Fed's policy planning much more complex. The monetary policy divergence among the major central banks is the issue at hand. With the BoJ suddenly accelerating its QE program, the PBoC cutting rates, and Mario Draghi hinting at a potential QE program in the Eurozone, the Fed is becoming increasingly isolated in its plans to begin rate normalization. Even India's RBI, who has kept rates elevated for some time, may begin to ease soon as the nation's inflation and money supply growth slows. As a result of this divergence, the US dollar has been on the rise this year. Of course the recent increase in and of itself is not tremendous relative to historical levels. However, given the disinflationary pressures around the world, the rising US dollar effectively "imports" disinflation into the US. Moreover, the massive drop in energy prices, caused by a combination of a significant rise in North American production and weaker demand globally (as well as the Saudi "dumping"), is adding to slower inflation. In fact, in recent months a paradigm shift has taken place. Weakness in inflation is no longer viewed as a temporary phenomenon as the longer-dated market-based inflation expectation measures turn sharply lower. Furthermore, professional forecasters are also downgrading their long-term inflation projections. Even consumer expectations of long-term inflation have shifted. Reuters: A Thomson Reuters/University of Michigan survey released last week showed that consumers see inflation averaging 2.6 percent a year five to 10 years from now, down from 2.8 percent predicted last month and the lowest reading since March 2009. It's not going to be about jobs going forward, in spite of the comments we continue to hear from the FOMC. The Fed's focus has shifted to inflation and inflation expectations. And no matter how low the unemployment rate falls, it will be difficult for the Fed to pull the trigger on rates, risking further strengthening of the dollar and more downward pressure on prices. It is possible the Fed will wait for growth in other major economies to stabilize before liftoff in the US. Which is why some economists (like those at Citi) are pushing rate hike expectations further out in time. Unfortunately the longer it takes to get there, the more disruptive the effect of normalization will be on global financial markets - as the Fed's zero rate policy moves into its 6th year and possibly beyond.